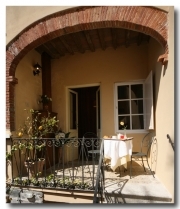 The Residence is situated in the historical center of Lucca to 1 Km from the railway station, to 20 Km from the international airport in Pisa and to 65 Km from the airport in Florence. Placed in favorable position, it allows to easily visit all the beauties in Tuscany as Florence, Pisa, Siena, St. Gimignano, the sea of the Versilia or the mountains of the Garfagnana without forgetting the outskirtses of Lucca with her magnificent Villas and the farms. Residence Santa Chiara is an ancient bourgeois house built in the second halves 500, in the historical center of Lucca inside the medieval boundaries. It is found in front of the suggestive gardens of Bottini Villas, once residence of Elisa Bonaparte, and where today, in the summer period, numerous cultural and musical events are developed that pleasantly animate the evenings lucchesi. From you can be reached afoot here, in few minutes, all the principal historical attractions of the city, the Roman amphitheater, the tower Guinigi, S. Michele plaza and the central street Fillungo with her numerous rich shops of history. Entirely to family management, the Residence Santa Chiara welcomes her guests in an atmosphere from the ancient taste, but with the most modern comforts of which she prepares. Restructured in June 2005, the Residence Santa Chiara is composed from 1 single room, 3 double rooms and a family suite with angle stay and balcony with direct access to the garden. All the rooms are endowed with of private bath, with shower or tub, tv color, conditioned air, electronic safe, minibar, hair dryer, heating and kit of courtesy. 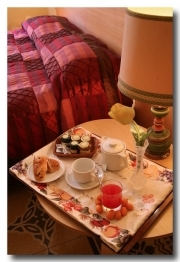 The Residence has a proper service taxi with decennial experience, and he offers therefore the possibility to organize transfers from and for airports and railway stations to facilitated rates, the possibility to effect tour and trips in the whole Tuscany, with auto of prestige and with drivers that correctly speak English and German. You can reach Lucca on the Firenze-Mare (A11) motorway or the Genova-Livorno motorway (A12). Pisa airport is 25 kms away and the airport at Florence 75 kms away. The nearest port is Livorno which is 60 kms away.